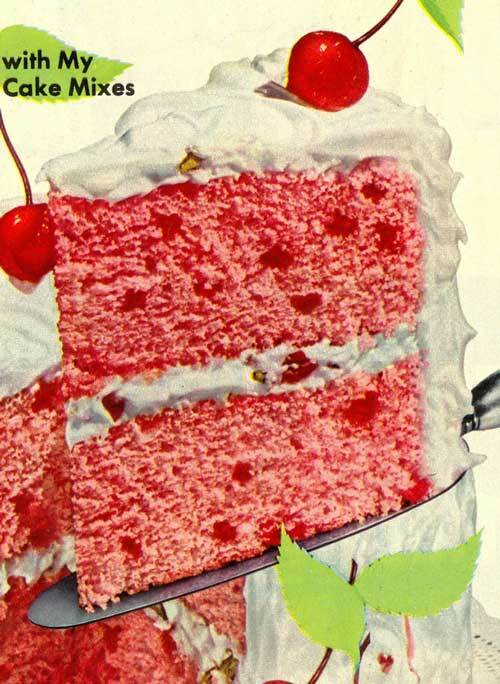 From 1952, it’s a recipe for Cherry Blush cake from Aunt Jemima. Now THIS looks like a cake I would seriously enjoy (we will be adding up a post about it when we make it). A box white cake, with maraschino cherry juice in it. YUM! Reading over the instructions in the ad, the recipe seems more than simple to make. The biggest issue is that I do not believe that Aunt Jemima makes cake mixes any more (feel free to let me know if I am wrong on this one). Now looking at the ad, there are some people (probably of the younger set) that may be offended by this ad. I mean, first you have Aunt Jemima (we are not going to say anything more on that one), and the use of the phrase ‘gay green leaves’. I am going to assume that the use of ‘gay’ in this context means happy. OMG, I just had a Bob Ross and his happy little trees flashback! Now that it has passed, we can continue. I am going to assume that this cake could be made with a different cake mix that is “Just add water”, and have written out the instructions to go with that. Other boxed cake mixes might work too, but we do not know how it will come out. Actually, we do not know how this one will come out either…yet. Let us know if you try this recipe, and how yours came out, in the comment section! Prepare cake according to package instructions; being sure to replace water called for in the instructions with the 1/2 cup each of water and maraschino cherry juice. Allow the cake to cool once finished baking. Frost the cake, and garnish with maraschino cherries and crepe paper leaves. This recipe comes from the February 1952 issue of ‘Woman’s Day’ magazine, and was scanned by File Photo Digital Archive.